The Crystal of the Day for Tuesday 10 December 2013 is Watermelon Tourmaline in correspondence with Mars, today’s planet. 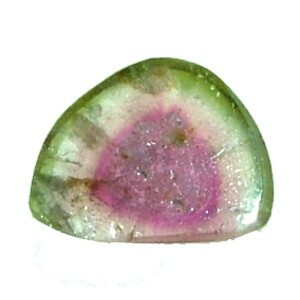 The watermelon tourmaline is a rare variety that displays three different colours in the same crystal – green (the skin of the watermelon), pink (the sweet fruit) and white (the rind). As in the gem stone ametrine, the colors of the watermelon tourmaline occur 100% naturally. This is a rare occurence in nature. The green part feeds your life force, while the pink soothes and harmonises. All of the tourmalines are used for their strong healing energies. The watermelon variety is used by crystal healers to encourage a calm, centred state of mind.